I’m not sure how many of you were counted amongst our readership back in June – it seems so long ago, now – but back when I joined the ranks of Digitally Downloaded, my first review was for Red Johnson’s Chronicles, a point-and-click adventure game that simply oozed coolness. Whether it was the smooth jazz fusion, the amazing landscape artwork or the overall artistic direction included, Red Johnson’s Chronicles remained one of the coolest titles for download on the PSN. Until now. Ladies and gentlemen, let me introduce you to the new king of cool: Rocketbirds: Hardboiled Chicken, available to you exclusively on the PSN. Rocketbirds is a platformer which, as a genre, admittedly conjures images of Mario and Sonic whom, while entertaining, wouldn’t be considered particularly “cool” by many people. But don’t be fooled; the platformer genre isn’t your dad’s Super Mario Bros. anymore. Gone are the days of simply jumping from block to block, trying to evade piranha plants and goombas; instead, the platformer has evolved to include such genre-bending titles like Shadow Complex, Outland and BloodRayne: Betrayal, all critical successes and all platformers that have taken the genre somewhere Mario never would have dreamt. Rocketbirds easily joins the ranks of such esteemed company, choosing the gunplay route of Shadow Complex as a basis. 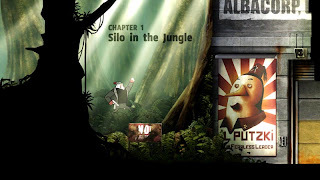 Indeed, there are quite a number of parallels between Shadow Complex and Rocketbirds; as mentioned, both have varied and gratifying gunplay, both have quasi-3D environments, both have simple yet mind-bending puzzles and both are quite a deal of fun to play. But I’m getting ahead of myself; let’s do this properly. The story of Rocketbirds: Hardboiled Chicken is a mixture between pure absurdity and a formula that has been proven by blockbuster movies around the world. The latter half of that combination is fairly simple: Hardboiled Chicken (our protagonist and main character) was once a commando working for a totalitarian regime, having been captured and brainwashed at an early age to do whatever dirty jobs needed doing. During one job, however, he is reminded of his own childhood and turns on his keepers, managing to escape. He then vows to put an end to this evil rule and sets out to kill the leader of the Communist-style regime in an attempt to put the world right again, killing anyone who stands in his way. this game is both gorgeous and hilarious. You see? It’s a pretty simple premise, one that has been done by many Hollywood movies over the years, but remains compelling and entertaining enough to make you want to continue. 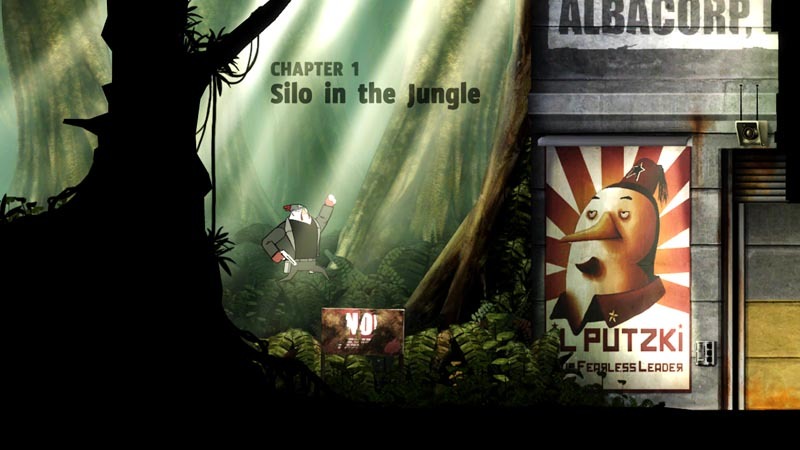 Of course, the absurdity comes with the fact that every character in the game is a bird of some sort: the protagonist is, indeed, a large chicken; the enemies in the game are penguins (whose armed forces look like German Nazis, circa WWII, but whose propaganda conjures memories of the USSR); even the rebel forces you come across over the course of the game are cardinals and budgies. It’s a tried-and-tested formula for a story wrapped around some serious tongue-in-cheek humour. It’s pretty magnificent, really. One initial complaint I had about the story, however, was that the beginning of the game makes no strides to establish who you are and why you are doing the things you’re doing. This confusion was quashed when, further into the game, the backstory and plot are established via a series of flashbacks. Still, you have to commit some time to the game before you get that payoff, so keep that in mind and just soldier through; it’s worth it. There are also a few unnecessary clichés thrown in (you occasionally have to fight clones of Hardboiled) but, overall, the story works quite well. The level design is decent, subscribing to the Metroidvania school of side-scrolling; as you move past the edge of the current screen, you are brought to a new section of the map. This works well for the presentation of the game though sometimes proves problematic when considering combat as shooting or tossing grenades off-screen is a waste of time; as soon as your bullets leave the current screen, they disappear instead of continuing on, making it impossible to attack enemies off-screen even if you know they are there. It’s a small complaint but one that I ran into a few times. The gameplay is pretty standard fare, a mixture between environment navigation, satisfying gunplay and a dash of puzzle thrown in for good measure. Admittedly, there are times when the controls can become a bit finicky; the circle button is used for crouching but pulling down on the left thumb stick has the same effect, which can be a bit troublesome when in the middle of a chaotic gunfight. Speaking of which; combat generally consists of small waves of enemies wandering onto the same screen as you. As I mentioned above, you cannot attack enemies off-screen so you either need to run towards them or wait until they possibly wander onto your screen. The former can be quite frustrating at times as occasionally enemies will be waiting for you to appear and will shoot you before you have a chance to retaliate but the generous checkpoint system and the overall driving force present in the game counteract any lasting frustration. Most levels are fairly linear, occasionally requiring you to figure out a navigational puzzle in order to reach a security card to go through the next door, Doom-style. Each environment, however, is exquisitely detailed; at times, the environmental art is something to marvel at, never falling below the standard which it sets for itself. It is a gloriously quasi-3D world, with two-dimensional backgrounds shifting with perspective as you cross each screen, and every platform in the world being drawn to show it should be considered in three dimensions. There are also a number of sections where you strap a rocket to your back and fly up into the air, doing battle with other rocketbirds and rocket-toting helicopter birds, before landing on a larger aircraft and blowing it up from the inside. These sections evoke memories of your standard shoot ‘em up’s but still contains enough character to be unique. It’s also a fairly tongue-in-cheek joke that speaks volumes about the sense of humour present in the game; remember that neither chickens nor penguins can fly! Thus, they need jetpacks to fly. It’s pretty hilarious, honestly, and there are plenty of jokes to be had throughout the game. I had quite a number of genuine laughs as I played, even despite a fair quantity of toilet humour. It’s a funny game, people; perhaps not Double Fine funny, but funny all the same. going to take over the world. We have been warned! Something that I unfortunately have not been able to try is the cooperative mode that is included with the game; it is supposed to contain a secondary story that runs alongside the singleplayer campaign and seems to include a fair bit of variety, as there are six different characters to choose between, each of them specializing with a certain weapon. If the singleplayer is any sort of gauge, I imagine that it is a great deal of fun but, as it is only local co-op, I have not had a chance to sit down with a friend to try it out. Before I wrap this up, I really have to talk about the music. Oh, the music. As far as the audio portion of the game goes, the sound effects for the guns are fairly standard and the voice acting in the cutscenes is passable but the music is what really brings the game together. Having hired New World Revolution, a real-life band, Ratloop Asia uses NWR’s songs as the music for the game. This is a trend in the video game industry that I’m rather enjoying; there have been a few games in recent memory that have used music with lyrics, whether conscripted specifically for the game or not, to great effect. Borderlands and Red Dead Redemption are two that spring to mind immediately, and Rocketbirds: Hardboiled Chicken succeeds greatly due to this decision. NWR’s songs bring a great deal of character to the world of Rocketbirds and, consequently, have earned my patronage – I just picked up one of their albums off of iTunes. It’s a great marketing strategy on both sides and one that, in my eyes, has succeeded. 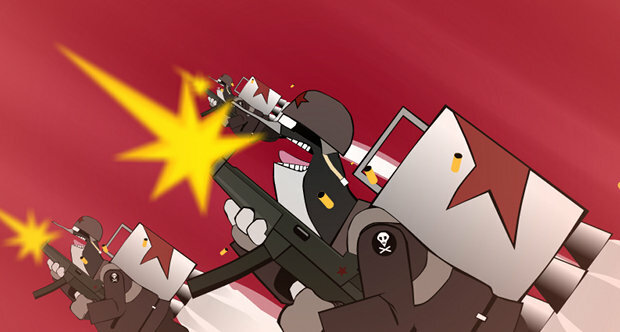 All in all, Rocketbirds: Hardboiled Chicken is a great game. It’s a game that is perhaps over a bit too quickly but with the sheer quantity of coolness packed in here, it might damage your delicate senses if it lasted much longer. With amazing music, stellar visuals, entertaining gameplay and a sense of humour that most games can only envy, I’d recommend this one as a must-have PSN title. Get it, enjoy it, revel in its coolness. You won’t regret it. Item Reviewed: Review: Rocketbirds: Hardboiled Chicken (PSN) 9 out of 10 based on 10 ratings. 9 user reviews.